New York City has raised the bar in recent years for rolling out bicycle improvements and reclaiming public space from automobiles. While San Franciscans have come to expect major delays for bike projects as the norm in their city, New York, the only American city more dense than SF, has zoomed ahead by adding roughly 20 miles of protected bike lanes since 2007, with more on the way. After each new NYC bikeway is built, injuries to all users decline and bicycling increases along the corridor. How can San Francisco emulate New York’s success? In short: San Francisco’s public officials need to exert bold leadership to hasten a painstakingly slow planning process intended not so much to achieve specific goals, but to avoid rocking the boat. That was the general sentiment at a recent forum where local bike advocates popped questions at Paul Steely White, the executive director of Transportation Alternatives, New York’s leading advocacy organization for bicycling, walking, and transit. “New York’s success, tenaciousness, vision, and drive have been guiding the way for other American cities,” San Francisco Bicycle Coalition (SFBC) Executive Director Leah Shahum told an audience at the San Francisco Planning and Urban Research Association last Thursday, where she and White discussed the state of the bicycling movement in the two cities. NYC DOT Commissioner Janette Sadik-Khan has earned a reputation for pursuing groundbreaking projects like the two-way bikeway on Prospect Park West, which produced major benefits and, despite high-profile resistance from a small group of politically-connected NIMBYs, has been largely embraced by the public. “There’s enough data now to show that it’s simply inhumane not to add bike lanes and pedestrian infrastructure when there’s an opportunity,” he added. In the SFMTA’s most recent bikeway project delay on three critical blocks of Fell and Oak Streets, the agency abandoned their initial approach — building it as a trial project that staff said could be implemented within a year (by this June). Instead, they tried to appease car owners upset over the loss of 80 curbside car parking spots, adding nearly a year to the project timeline (construction has since been moved up to next winter). In NYC, protected bike lanes on some corridors have re-purposed hundreds of on-street parking spaces without replacing a single one. While NYC DOT has looked to offset the parking loss for some bike projects, the agency has never delayed a safety project solely to blunt complaints from car owners. New York’s leaders have shown that progress ultimately depends on the willingness of transportation officials and politicians to stand behind the proven safety and mobility benefits of improvements like protected bike lanes. “The leadership they have at the Department of Transportation and the higher level of political leadership has meant they have been able to move faster,” said Shahum. While San Francisco’s leaders haven’t stepped up for safer streets in the same way New York’s have, it’s not for any lack of popularity with the public. The SFBC has recently touted its findings that 7 in 10 San Franciscans rode a bike in 2009, and the SFMTA announced last month that bicycling rates have jumped 71 percent in the last five years. Comparing membership rates alone, White pointed out that San Francisco’s bicycling movement is actually larger than New York’s — in fact, the SFBC has more members than Transportation Alternatives, despite New York being 10 times bigger. San Francisco also has the advantage of a driving culture that’s more respectful towards bicyclists than New York’s, said White. Demonstrating existing community support and the documented benefits of street improvements, White said, has been a successful strategy for Transportation Alternatives in dispelling myths about street redesigns. To counter opposition spouting doomsday predictions of traffic congestion, failing businesses, and increased danger, TA has promoted findings that bikeway projects in New York have consistently made streets safer for all users, with decreases in traffic injuries as high as 56 percent. The SFBC has employed a similar tactic, promoting findings like the demonstrated boon for bicycling and transit speeds on Market Street since the SFMTA began diverting car traffic off the street and painted the city’s first physically-separated bike lane. “One thing that Jan Gehl said when he came to New York, because we were throwing up all the reasons why we had heard we couldn’t do what they did in Copenhagen, or Paris or wherever — he says, ‘What the hell are you talking about? You have these enormous, wide streets,'” said White. In San Francisco, he pointed out, the streets are even wider. “I come here, and see all this real estate,” he said. Look, Ed Lee was elected mayor because he knew how to work within the system, not because he was animated to change it. If people who bothered to vote had wanted change, there were at least a couple of candidates to vote for. But voters did not want change. Forget structural future deficits. Forget the near absence of middle class housing. Forget public schools you send your child to without serious worry. Forget public transit that’s faster than the private automobile. Ed Lee is a creature of the “City Family” — his term, not mine. And that City Family is first and foremost about protecting city employees’ jobs. Second, it’s about delivering services without upsetting existing relationships with privileged vendors. Third in importance is enacting certain changes without upsetting powerful interest groups too much. You can call that consensus politics or you can call it a blend of corruption and technocracy. But whatever it is means, profound changes will be effected incrementally. In this instance we will get that bike and ped infrastructure, but it will take 5x longer than you’d like. Biking corridors are great… If cyclists use them. The conversion of lanes on Sloat seem to have been a wasted effort; and other streets given dedicated biking lanes don’t seem to pick up use from other roads. This needs to be intelligently planned. Are they simply being created for political platitudes, or are they usable and benefitting ALL road users? I agree in general with the sentiment of the article. However, I do find the need to nit-pick a bit. NYC has done a ton, but they have generally tried to minimize parking loss and limit increases in driver delays. This means most of the bike paths were installed by removing excess travel lanes or narrowing existing travel lanes. The “hundreds” of parking spots comparison is a bit misleading. The Fell & Oak plan reduces 80 spots on 6 blocks, while the 1st & 2nd Ave plans that were linked to, remove 166 spots on 60 blocks, which is quite a different scenario. I think this is important to keep in mind. Yes, NYC has done a lot, and has faced down some tough criticism on many projects. However, there have been several projects delayed or cancelled, and there are still huge gaps in the network, where DOT has said there is too much traffic for anything but sharrows. In fact, due to a growing backlash last year, barely any new bike facilities were installed at all. The point is, NYC DOT has been very strategic about judging local resistance and pursuing strategic projects accordingly. SF appears to be doing the same, just at a glacial pace. The sloat lanes are great. I use them. That road was 3 lanes in each direction which was complete overkill. Without causing any impact to traffic we have removed conflicts. No pain, much gain. Aaron, this is a well written and insightful article in my opinion. Before I lived in SF I thought of it as a progressive, liberal city that was probably a leader in bike, pedestrian and traffic calming infrastructure. Boy was I shocked to find that many other cities on the continent are so far ahead of SF in terms of installing curb bulb-outs, bike lanes, modern intersection design, etc. SF in many ways looks like a 3rd world country. Actually, many 3rd world countries look *better* than SF because they spend real money on infrastructure, not like in SF where it seems most of the money is flushed down the drain and people happy to simply coast on SF’s reputation of the past. I guess that’s consensus politics, where nothing gets done and a $6 billion annual budget magically disappears every year with no results to show for it. The rules of the game are different in SF than in NY. California has CEQA, which has and will add to the timeline of projects. There is also an ongoing backlash in NY over the lack of community involvement that will hinder future NY projects. There is also an ongoing backlash in NY over the lack of community involvement that will hinder future NY projects. Nope. 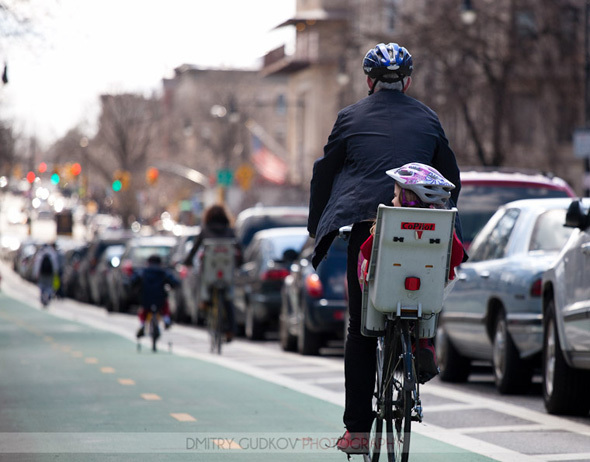 Every NYC protected bike lane has received a vote of approval from the local community board. Opinion polls surveying a broad cross-section of New Yorkers consistently show 55-65 percent approval. Have there been complaints? Yes. The difference is that in NYC under Bloomberg and Sadik-Khan, small but concentrated NIMBY opposition tends not to derail projects that have broad support. The city is building 10 miles of protected bikeways this year alone. Expect them to build more after they launch the biggest bike-share system in North America. City Hall has given you folks everything you’ve asked for and is getting ready to screw up both the Panhandle and Masonic Avenue. But to the anti-car Jihad, it will never be enough! Are you saying that removing some parking spots on one side of the street equates to screwing up the panhandle? My wife was just remarking yesterday how getting from the panhandle at Masonic to Trader Joe’s (at Geary/Masonic) and back is a royal pain in the tuckus on a bike. Masonic is a nightmare, and there are no good alternative routes. They can’t fix that street fast enough in my opinion. Rob Anderson! You spelled your name wrong!